We all have heard about Louvre and Notre Dame Cathedral in Paris, Big Ben and Westminster Abbey in England, Colosseum and The Pantheon in Rome. But what do we know about masterpieces in the Middle East? As it turns out, they are just as great and monumental as the ones from the world capitals. When it comes to travel to Iran or the Middle East, it is hard to count down or even remember the most beautiful buildings that take our breath away. The point is, in that region real artworks are not the buildings, but details of palaces, mosques, madrasas and even private houses – pattering on a mosque ceiling, hypnotizing beauty of windows, blue and green marvelous mosaics. All of that represents one of the most beautiful and inspirational visual traditions the world has to offer. But what is a mosque? It is not just a Muslim place of worship. If you find yourself inside the Iran mosque, you will likely find exquisite examples of traditional tiles, which seemed to repeat infinitely. You will be astonished by the beauty of the patterns that have been inspired by the faith of its architects and Persian cultures. Here is Iran travel guide or what I call “the list of epic buildings and its ornaments that you will not take your eyes off”. Start your trip to Iran with this article from https://icheapessay.com experts. The Jami Mosque (or The Friday Mosque) in Isfahan is one of the oldest in Iran. It is an architectural masterpiece that has become a role model. Since the 12th century, most of the religious building of the Muslim world were inspired by the design of the Friday Mosque. All the architectural changes which occur in this region we can see through that building. It is a timeline of historical architectural innovations. The masterpiece combines elaborate brickwork, ornaments, and tiles. It is a four-iwan mosque that opens up into a large courtyard. What great about these forms is a way they captured like a facet on a gemstone, they capture light. As the Sun moves and changes through the sky during the day, the ceiling seems to move. It looks like it spins, like the stars in the heaven above a pole star. In short, it is a cult place not only for Muslims but also for all admirers of beauty. The beauty of tile work in the entrance of Pink Mosque Iran (it is how they call it) looks unique and quite attractive. But as soon as you enter the mosque, you will understand the meaning of the phrase “Iranian beauty”. One of the most famous mosques in Iran is known for its marvelous light and carved pillars. But the unique feature is stained-glass windows. The sunlight coming through the window casts color patterns onto the fabulous carpets on the mosque floor, and this is the reason why they call it a rainbow mosque. It is a favorite spot for photographers from all over the world. Besides, an essential role in decoration plays a variety of mosaics that were created from multicolored glasses. Patterned ones can be seen not only on the walls but also on numerous arches and vaulted ceilings. Bright pink tile covers the floor. 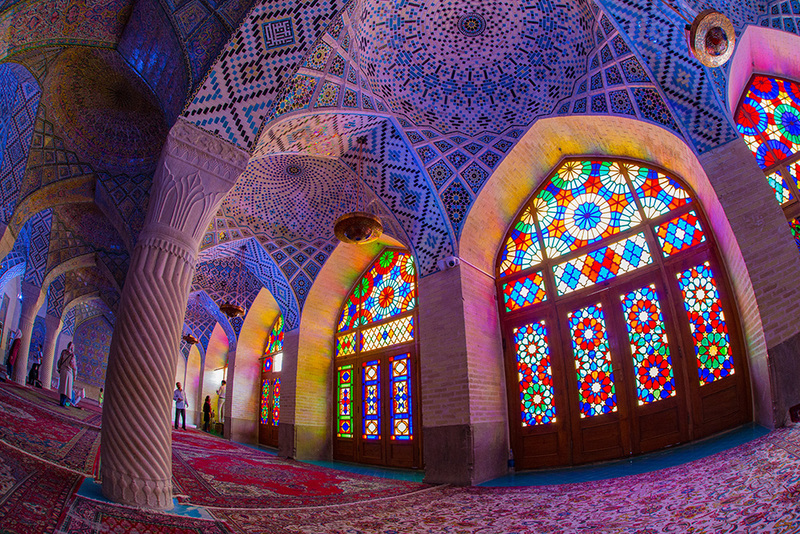 The entire decor of one of the most beautiful mosques will astonish you by a combination of bright, amazing colors. Over 300 types of roses are traditionally grown in Shiraz. These flowers became the central element in the design of the mosque. Built towards the end of the 19th century, this is one of the most elegant mosques in the Middle East. It is a place where the light and worship intertwine. In sunny Iran, on the bank of the river Zayanda, the largest city of the eastern country is located – the ancient Isfahan we have previously talked about. It used to be the capital of Persia with its luxurious palaces, exquisite minarets and a lot of beautiful fountains. Some architectural monuments of the past have preserved till nowadays. One of the most vivid sights of Isfahan is the true masterpiece of ancient Arab architecture – the Imam Mosque, also known as the Shah’s Mosque. The structure is impressive by its dimensions as well as by its shape. All this beauty was created by the hands of the court painter Abbas I – Reza Abbasi. To express all of the Middle East beauty, Shah ordered him to use multicolored glazed tiles, painted in a particular technique with geometric and floral ornaments. The punch line of the Imam mosque is extraordinary acoustics. The domes’ complex architectural forms make repeating one sound up to 12 times possible. Therefore, whispering a few words at one of the walls of the building, you can easily hear them in the most remote corner of the mosque. That unique mosque has been under construction for 15 years, from 1603 up to 1618. This is a private mosque of the Shah that was intended exclusively for the Shah’s wives. That is why the second name of that building is the Women’s Mosque. Quite a rare feature, there is no courtyard and minarets in the mosque. The wives themselves entered the mosque on a special underground passage. Three Suras from the Koran were written by using white tiles on a blue background. One of the unique features of the mosque that takes your breath away is the stylized magical peacock in the center of the dome that shows up when the sun comes out. If you stand at the entrance, you can see the body of the peacock and his magnificent tail. Staring at that gorgeous bird, you do not even notice how quickly two hours will pass. It is interesting that the pattern on the tile is not symmetrical, although it is difficult to notice. Art critics believe that this was done consciously. It is perfect in its asymmetry, as perfect as asymmetric harmony of the universe. Think about it – the tile’s age is almost 400 years, but it has not lost its beauty, the colors have not faded, it has not collapsed. This is the first mosque decorated with tiles of yellow and pink flowers (apparently, Sheikh wife loves pink). Previously, all of such constructions were colored exceptionally with green and blue. Undeniably, the first place in our list will be awarded to the most fairytale mosque not only in the Middle East but in the whole world – Shah Cheragh. It is the emerald mausoleum, fabulous mirror mosque that richly ornamented with glittering glass shards, jewels and silver pieces. The tomb of the brothers Ahmed and Muhammad that was built in the 14th century and attracts tourists from all over the world to witness the miracle of architecture. In the mausoleum there are two minarets, fantastic decoration of the hall is octagonal columns of green marble. The interior of the mosque strikes you at first sight: it seems that emerald, yellow, flaming red and crystal-clear blue pieces of cobalt glass burn in the sun. The windows are decorated with stained glass, a fantastic mosaic is reflected in endless mirrors. Magnificent crystal chandeliers, luxurious red Iranian carpets, green marble floor, look like decorations for Alice’s Adventures in Wonderland. This is the case when it is better to see once than hear a hundred times. This entry was posted in Travel on March 4, 2019 by Amélie.